In Travancore Dynasty copper coins are usually available as ‘Chuckram’ or ‘cash’. Here is Four Cash which had been in use during the reign of Uthram Thirunal Marthanda Varma ( 1847-1860 CE), former ruler of Travancore. This round shaped coin has approximately 2. 58 g weight. 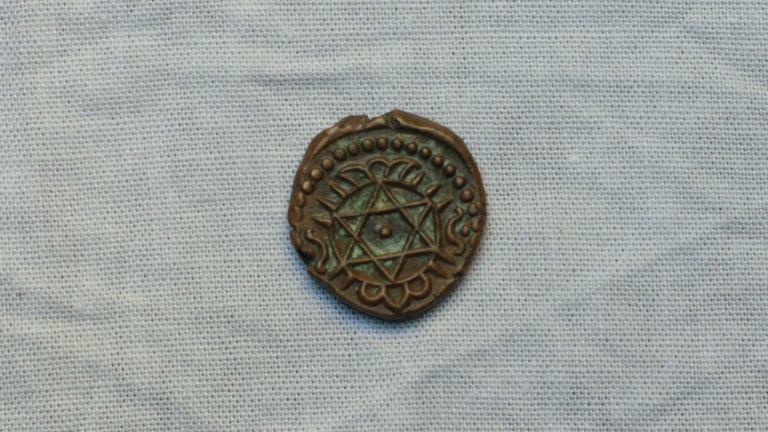 Obverse: Within a circle, an image of Lord Sree Krishna holding butter balls in both his hands along with the Malayalam numerical 4 below it is visible. Reverse: Sudarshana Chakra is pictured within a circle of dots.